With the Pebble Steel Smartwatch, you can read email, texts, incoming calls, calendars, and access your favorite apps on your wrist. Designed to make your life easier, the Pebble Steel smartwatch easily connects to your iPhone or Android device via Bluetooth. It’s a straightforward, wearable design that lets you get the information you want. Calls, messages, texts, and other stuff you want to know about. And don’t worry about the battery life. Pebble Steel will let you go about your busy schedule, day and night, with a battery that will last up to 7 days on a single charge. The Pebble e-Paper display is easy to read, even in bright daylight. It’s continuously active so you can always get your alerts, notifications, and of course the time, in just one glance at your wrist. Pebble also alerts you with customized silent vibrations to incoming calls, meeting reminders, and texts, allowing for eyes and hands-free notification. Pebble Steel brings smart function and elegant form together. Crafted from marine-grade stainless steel and Corning® Gorilla® Glass, it’s as tough as it is good-looking. Swap out the black leather band for a metal one and the watch becomes shower- and swim-friendly, up to 50 meters deep. Pebble does more than just tell the time. You can make it your own with specific Pebble apps for your daily lifestyle. Get the latest scores, access your Starbucks card, track your fitness program, or control your favorite music on iTunes, Pandora, and more. 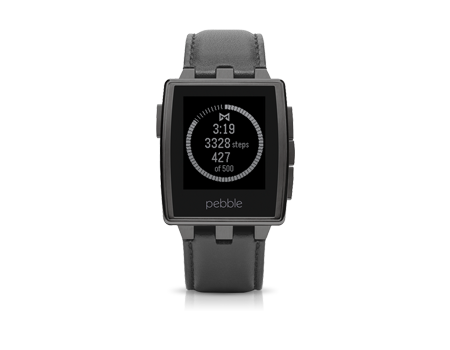 Pebble Steel brings smart function and elegant form together in a high-end package. Ruggedly handsome, Pebble Steel is crafted from marine-grade stainless steel and Corning Gorilla Glass, so it’s as tough as it is good-looking. And it’s built with the same brains as Pebble, so you can have the latest scores, your Starbucks card, or even your boarding pass on your wrist. It’s the smartest watch you’ll ever own, and the smartest-looking watch we’ve ever made. Ships with a black genuine leather watch band. Choose from a variety of apps for fitness, music, and games from the Pebble App Store.